I stood in the little herb shop today, wanting to buy some eyebright to make a soothing eye wash for Raven. She had chemo on Wednesday and now has irritated eyes, aches and pains, and seems very sad. I'm sad too - between harrowing images of human and, yes, animal suffering on CNN and flooding into my email box, and watching Raven descend into her chemotherapeutic depression, knowing that however good my intentions, I'm responsible for subjecting her to it - I'm so sad and lost right now I hardly know how to describe it. So when they told me they had no eyebright, I just wandered around the shop, looking at what they did have on their well-stocked shelves. Turmeric, I thought - I should buy that, I heard it's good for cancer. I idly picked up jars of unfamiliar Ayurvedic herbs and familiar Western herbs, looking for something, anything, that would make my dog well. And then I started to cry. Because there really is nothing in that store, or any other store, that I can buy to beat this. I got home and she was still where she'd been five hours before. I couldn't lure her off the sofa, but she ate food from my hand. At dinnertime I made her get up, but she only staggered a few steps before sinking onto a dog bed, exhausted. I know that chemo reactions can be violent and horrible, but after four treatments so far, this is the first one she's had, and by any standard it's mild. Except mine, because the sadness in her eyes is killing me. The first time she had chemo was the day she had her stitches out from the amputation. She slept through it, her head in my lap. But every subsequent time she's been less accepting, more distressed. I thought we might be faced with vomiting and diarrhea and some kind of major upheaval of her body that I could point to and say, enough. But instead it's just this sadness, this shadow in her eyes, this weakness and loss of joy. Today I spent hours adding Hurricane Katrina pet-related stories to the news feed on one of the sites run by the company I work for, Pet Press.net. Some of the stories made me cry like a baby, dogs and cats being crudely euthanized by people trying to spare them drowning and slow starvation. A little dog scratching at the door of the bus taking his owner away. A report from a veterinarian on the scene not able to give more than the most basic care to the animals in need of so much more. It's not that I don't like people. It's not even that I like dogs more than people. It's that I view the world through a certain kind of filter, the one that cares what happens to the world because it's the world my dogs live in. And I feel so helpless, helpless against all the things that threaten human and animal life. All the things that rip beloved animals from the arms and care of people who cherish them. All the things that implacably smash that powerful force we clinically call the "human-animal bond." Things like hurricanes. And cancer. Tonight Raven seems a little better. She ate her dinner, she drank some water, she batted playfully at my head when I knelt down to hug her. I thought I saw some sparkle in her eyes. I gave money again to the Red Cross and to a fund for veterinarians volunteering in the disaster zone. I flushed her eyes with sterile saline and made eggs poached in beef broth for her dinner. I knelt next to her with a water bowl, and she had a drink. When oncologist Greg Ogilvie DVM talked to me about Raven's osteosarcoma, he told me there are only three things that matter when talking about cancer treatment of animals: Quality of life, quality of life, and quality of life. I had Raven's left rear leg amputated for one reason only: To control her pain. It's worked brilliantly, and she has needed no further pain medication of any kind. And I was fully prepared to have to limit her activities, protect her from the other young dogs, make allowances for her. My mom and I had talked about different carts we might get to help her get up and down to the creek. HAH! After about 7 weeks, Raven is trucking around this place like she was born with three legs. She can go up and down to the creek, runs and plays with the other young dogs, goes on the whole "young dog" walk with us twice a day (and still has the energy to chase Kyrie in the dog door at the end). The other day she came to me while I was working here on my computer (actual work, the kind that pays her obscene vet bills, not this frivolous blogging) and whimpered, a signal we've worked out that shows she needs something. I of course leapt up and went with her, assuming she wanted to be let outside as our laundry room dog door is temporarily closed while we do some work there. She marched over to the sofa where her brother Rebel was sleeping and looked from me to him and back again, obviously expecting me to cater to her every whim as I'd been doing since she was stricken with cancer in May, and boot him off her chosen nap spot. I burst out laughing and told her to think again. She was definitely surprised but sheepishly got on the office sofa and made do with that. Oh, the horror. I'm becoming very annoying on the various email lists and forums I'm on begging people not to decide against amputation for their dogs. I've read about dogs with hip dysplasia doing well after amputations, about dogs who weigh over 200 pounds doing well, of dogs whose owners and vets swore they couldn't function on three legs who are out in the yard running and playing as their owners report the miracle to the other listmembers. Having seen what I've seen, I can't help being a little pushy about this. However long it lasts, if what you want is quality of life, this is it. Do you know the number one way that osteosarcoma kills dogs? It's not the tumor itself. It's not metastases to the lungs. It's not the spread of the cancer to other bones. It's because their owners put them to sleep because they can't control the pain of the slowly-exploding bone. 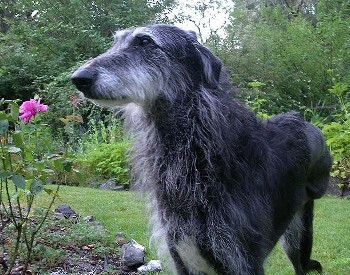 Unless your dog already only HAS three legs (and I've heard of a border collie who gets by on two, but even I would draw the line there for a deerhound), odds are that they really will be fine after the amputation. Dr. Ogilvie told me that over 95 percent of his clients who opt for amputation would do it again. How many decisions do we make in our lives with those kind of odds? She runs in her sleep. 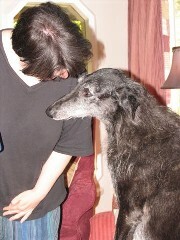 Raven, I mean, my Scottish Deerhound who had her left rear leg amputated last month after bone cancer had eaten a big hole in it. She runs in her sleep. 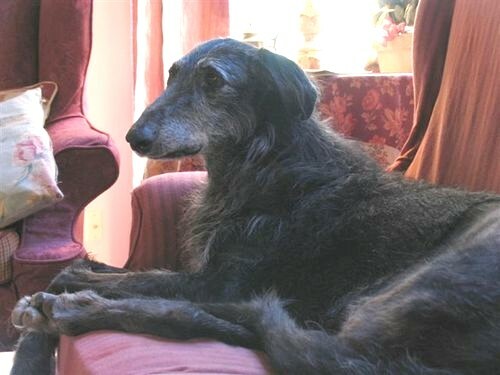 Lots of my deerhounds seem to do that: Their closed eyes darting, their legs bunching and releasing, their necks extending and drawing back in. They're dreaming of running after a hare or a deer, or maybe just after one of the other dogs in a play version of the hunt. 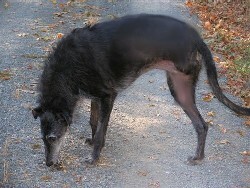 When Raven does it, the remainder of her amputated leg still moves with the other one, draws up and extends in a dreaming double-suspension gallop. Her eyes dart and her neck pumps and when I put my hand on her side, her heart is racing. 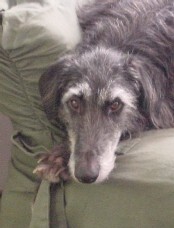 The chase is on and she's in it, coursing with the other hounds after a dream deer. I sat on the bed next to her this morning at around sunrise, my knees drawn up to my chest and my feet tucked under the edge of my quilt. She was having a great run and once or twice she gave a muffled little bark of excitement. 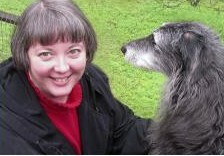 Since deerhounds run silent and only vocalize when they've caught their prey, I have to guess her hunt was a success. Every day except when she was at her sickest after surgery, Raven has greeted me and the morning with joy. Her eyes light up, her tail thumps, and she gives me a slurpy kiss good morning. She waits until I've cleared the other dogs out of the room to get up now, though, as she's scared to jump off the bed and and catch her balance when they're around. Then she sails off and gallops outside to potty, one front leg moved back to form a stable tripod while she pees. Then I let my two oldest dogs out the gate and the three of us walk down to the edge of my property and back, Raven making better time and covering more ground than my four-legged senior citizen, Rosie. Sometimes she hops up the fairly steep hill next to the drive, sometimes she just looks at it appraisingly and decides against it. 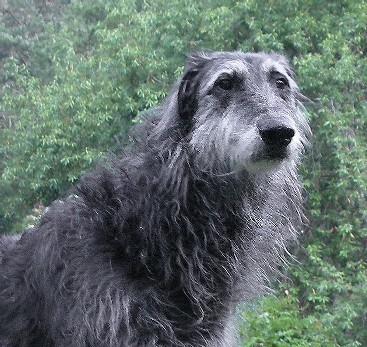 Now and then, for a change of scene, I shut the young dogs up in the house and let Raven into the meadow off my deck, and she races around on her three legs, in a funny little hitching gallop that would still outpace any dog but another sighthound. She may never run with the pack again, never scare up a jackrabbit and fly after it like the wind, never put four legs to the ground and then into the air in the flying gait that's the hallmark and definition of her breed. That wasn't something that she lost because I had her leg amputated, as some people either ignorant or unkind, or perhaps both, told me when I made the decision. Cancer took that away from her, not the surgeon and not me. As the oncologist told me at the time, dogs are born with "three legs and a spare." Will Raven be one of the 15 percent of dogs with osteosarcoma who has amputation and chemo and never has a recurrence of their cancer? Or maybe one of the 30 percent who makes it to two years? Those aren't great odds, but they aren't zero. Obviously we're going for the 15 percent. Maybe all we'll get is two years or a year, or even a few months, of dreaming about the hunt and hitch-galloping around the meadow, of watching her flying after a deer in her sleep. Maybe she'll overcome her nervousness and fear and play with the young dogs again. Maybe, just maybe, she'll fly again. But I know one thing: Dead dogs don't play, or run, or hitch-gallop, or smell at the ground, or have their eyes light up in the morning.